If you tire of Berlin (how dare you?) and decide that you want to reacquaint yourself with the natural world, you might want to try Die Ostsee, the Baltic Sea. If you look at the brochure for Tropical Island and decide that fake beaches, Caribbean flags and Speedos beneath a huge iron dome aren’t to your taste, you can try the real beaches of northern Germany, where Speedos and Caribbean flags come with thousands of tourists each summer. Not der Liegestuhl (the lie down chair), but der Strandkorb (a beach basket). The Baltic Sea is better than Tropical Island because it doesn’t promise Madagascarness and deliver something that slipped out of a George Orwell manuscript. The Baltic Sea has a self-acknowledging humility about its beaches. Resorts like Usedom were once hangouts of the more prosperous in Eastern Germany before the fall of the wall, but Ryanair and Easyjet's pull to overseas sun parlours ruined its allure. But Germans of the north still love it. The beaches are more Brighton than Thailand, and the local residents aren’t particularly happy (at least voting patterns suggest so) with tourists destroying their quaint communities and raising house prices. But Ostsee is still a lot of fun and the local residents I met (8) were all very nice. 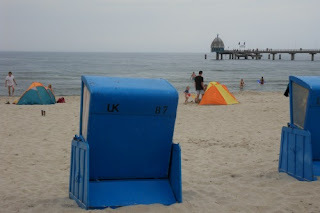 If you plan to go to the Ostsee, the best thing to do is just go for a day. That way if you don’t like it you can come home and if you do like it you can always go again. Take all your funny summer hats and make sure you arrive early on the sandy shores to get a deckchair, der Liegestuhl (the lie-down-chair), in a prime spot.If you want to go totally local, get a Strandkorb, a sort-of adult beach cradle. You’ll want to get physical while on the beach. Forget reading; you’ll be playing volleyball, frisbee, or water sports. If you try Ostsee and Tropical Island looking for water and sand but feel you've strayed unreasonably from urban comfort, you could always try the pay-to-swim beach at Wannsee open from Mid-April, or one of the many lakes around Berlin. The lakes in the West around Müggelsee are free however and a nicer spot to get drunk and bitten by mosquitoes while dipping in and out of the lake. If you simply won’t leave the city to swim, try Badeschiff, the pool in the River Spree. If you need water pools lined with Japanese trance visuals and music, with easy access to saunas and cocktails, Liquidrome might be more to your liking. All this is merely a preview, some delusional seasonal dream (drama?) or flashback. Summer is still locked away in hibernation. But if you want to get der Strandkorb under the sun for August on the Baltic Sea, you’ll want to start making enquiries. So true - thanks for redirecting our minds for a wee while on to those things that really matter in a city with winter now coming back again for the third time this year. Beaches in and around Berlin is def what I currently wanna dream of. And, hey, of course Samuel Johnson applies to Berlin - or could there be another reason for an S-Bahn not working with leaves on the line, double-deckers with grumpy drivers, gentrification from Canning Town to Lichtenberg... minus the tea, that is. And with compared to London escalators running at half-speed.